i have employed justin several times to take down trees, he does a great job and is a pleasure to deal with, plus the price is right. He is a local guy and i try to use people who live up here in the mtns with me..
Justin climbed and removed a fairly large pine tree that was to close to our house for comfort. He and his crew did a great job removing the tree, being very careful not to hit our house during the process. Once it was down they cut it up, stacked the wood and removed the slash all for a very reasonable price. We would definitely recommend and use him again. all the rain stops and the underbrush starts. Justin just finished doing a very hard tree removal and did a great job. Had to climb and top it before taking it down,( the tree was right next to the road, which made it difficult ,so it didn't fall on Shadow Mountain ) I would recommend his crew highly to anyone. A quick shout out to Justin. He came by and chipped a large slash pile for me yesterday. Great job at a very affordable price. I would highly recommend him. What is Justin's contact information? Justin did a great job to take down pine beetle damaged tree next to our deck, clear the slash, ground down the stump and was reasonable for the total job. Would recommend. Justin took down two trees for us. We are very happy with the work he did. The area was cleaned up nicely and the slash was chipped for us to use in our yard. He also cut the tree trunks into firewood sized logs that I can then split for firewood after being aged. Do you need a hard working tree climber that can trim or remove any tree in nearly any location? How about in the dark...on a Tuesday? Sure, all tree companies promise the world, but how many go that extra mile? Well a few weeks back we found out firsthand what that “extra mile” really is. Who would climb up a tree in the middle of the night to save a beloved family pet? Some background, right… to help paint the picture, now fade that imagination into black. Our oldest son owns birds, if one could own such beasts, independent little buggers to say the least! Back to the story - the 23 year old Nanday Conure decided he was going to exploring one fine Tuesday evening around 6 pm and landed in a nearby 125 foot pine tree. And yes, you may wonder “don’t birds live in trees?” - well yes, kind of, well not really - not this bird. Sequoia didn’t know that the Colorado Rockies can get a bit cold for a tropical bird- especially overnight, he decide he was staying put. It was adventure time for the bird, he had decided that this was his new home and had reverted to merely squawking insults down at us refusing to budge. After a few hours of bribery, lobbing soft objects and otherwise shooing him from tree to tree we were nowhere…and it was getting dark. So we called Justin, who without hesitation, came over to help and within the hour he was geared up and in the tree. And to say the least Sequoia did not choose an easy tree to climb. We rigged up enough portable lights to tan a football stadium and set to work finding the now hiding bird. Sequoia didn't even show himself, he plain hide from us. Undeterred up Justin went in the man made daylight at 11pm on a Tuesday. Now, it should be noted that all the man-made daylight didn’t reach into the top of the tree in any real or useful way. More than anything it just lit up Justin’s boots from below. After about 30 minutes of midnight tree climbing he made it to the top of the tree – birds like the top, thanks birds. There Justin was, perched in the tree top and yet there was no Sequoia to be found. After ten minutes of looking we almost gave up. The little bugger was hiding, and between the darkness and his green feather it made him almost impossible to spot. Turns out Sequoia had seen Justin coming and fearing for his little bird life was actively moving around in the dark to avoid him in the tree top. But after looking through the top of the tree Justin saw something that was not quite like pine needles so he grabbed it and voila! This was quite surprising to Sequoia who was the sudden victim of an impromptu game of grab [censored word]! He turned around and bit the tree man’s glove with no effect. At which point he flew straight at his assailant to bravely fight him off, but due to a horrible misjudgment of size, he was just stuffed into an awaiting pillow case with much complaining. This was only half the battle Justin then managed to climb down the 125-foot tree with the pillow case that had sequoia in it in his teeth and without falter made it all the way down. We then took Sequoia back inside, who other than having his feathers a little ruffled was just fine. He was immediately greeted by his bird buddies and went right to playing with his toys - not realizing how lucky he was. Although Sequoia was not happy to have his “vacation” plans cancelled. The apartment he rented from a local blue jay was forfeited and he did lose his deposit of 3 pine cones - didn't even get to spend the night! Once he was cleaned up and checked out we brought him into the living room to show the JWARD Industries Crew the fruits of their labor. 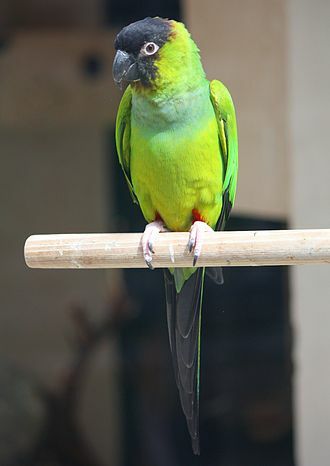 Thanks to JWARD Industries, Sequoia the Nanday Conure, will celebrate his 24th birthday and many more to come. In the end, we were incredibly lucky to have JWARD on our side! Justin is the best tree man in Colorado and no matter the size of your job he will get it done – be it really big or small and bitey. Ever since I bought my property I have been trying to mitigate the fire danger and remove dead trees. Shortly after moving up here I found Justin with JRWARD industries. He’s been doing tree work for me for several years! I’m slowely making a dent in the dead and dying trees and getting my property healthy again. I want to be a good caretaker of the land and Justin’s knowledge of local trees and bushes has helped me immensely. He’s done everything from take down a lightening struck twig as he liked to call the baby tree that was dying that for some reason drove me crazy; to clearing and mitigating whole sections of my property of dead and dying trees. I like that his is a locally owned and operated business. So big thank you to Justin and his crew for their hard work. If your looking for someone to remove, trim or mitigate trees I highly recommend Justin and JDWARD Industries. Call him today 720-231-4857 or 720-255-9009.